Here are three painted images of the mailboat in the popular imagination in the Bahamas. 1 – Mailboat CAPTAIN MB MAURA, with black hull and yellow stripe, as seen in the arrivals hall at Nassau’s international airport (Lyndon L. Pindling Airport). 2 – Mailboat / fishing vessel / retail vegetable store LADY MARGUERITE, possibly a play on the first independent Prime Minister’s wife, Lady Margerite Pindling, presently Governor General. 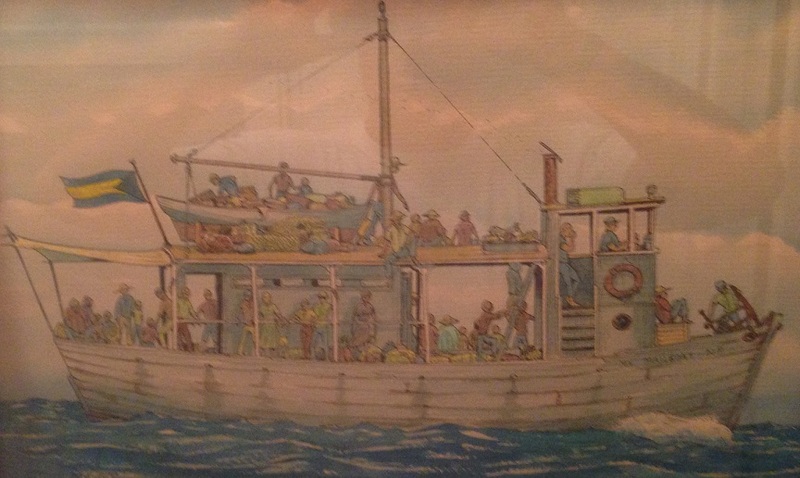 3 – A painting in the author’s home of a mailboat underway with passengers, etc. Artist unknown.